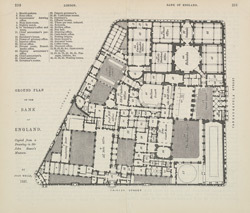 This plan is a copy of an original from the John Soane Museum in London. Its title appears at middle left with a key to offices at top left. John Soane was the Bank's third architect, extending the building's area to its modern three-and-a-half-acre span, though only the outer wall of his original design has survived into the present.